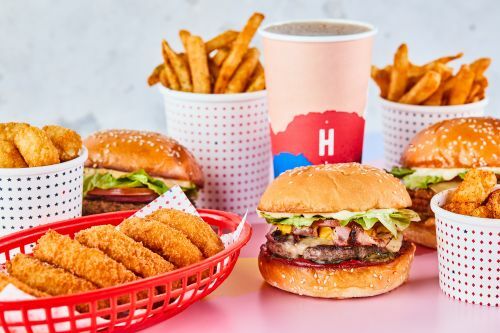 Menulog delivers for Huxtaburger - Hawthorn so you'll be able to track your courier on a map. Juicy double beef patty burger with bacon, cheese, cheesy mayo, pickles, tomato sauce and mustard with cheese and gravy chips sprinkled with a secret salt. Plus custom Peter Griffin or Stewie glasses inside every box! Cheese and gravy topped chips sprinkled with a secret salt. Double beef patty, bacon, cheese, cheesy mayo, pickles, tomato sauce and mustard. Grass-fed beef patty, cheese, mustard and tomato sauce. Grass-fed beef patty, bacon, cheese, mustard, mayo, tomato sauce, tomato,lettuce and pickles. Grass-fed beef patty, jalapeños, sriracha mayo, cheese, mustard, tomato sauce, tomato, lettuce and pickles. Grass-fed beef patty, cheese, mustard, mayo, tomato sauce, tomato, lettuce and pickles. Grass-fed beef patty, egg, smoked paprika mayo, cheese, mustard, tomato sauce, tomato, lettuce and pickles. Double grass-fed beef patty, double cheese, cheesy mayo, mustard, tomato sauce and pickles. Double grass-fed beef patty, double cheese, bacon, BBQ sauce, mustard, mayo, tomato, lettuce and pickles. Grass-fed beef patty, bacon, egg, pineapple, beetroot, cheese, mustard, mayo, tomato sauce, tomato, lettuce and pickles. Grilled or fried chicken, avocado, bacon, aioli, cheese, lettuce and tomato. Grilled or fried chicken, jalapeños, sriracha mayo, cheese, aioli, lettuce and tomato. Spicy bean & quinoa patty, jalapeños, sriracha mayo, cheese, mustard, tomato sauce, tomato, lettuce and pickles. Kale, zucchini & quinoa patty, hummus, pickled onion, beetroot, tomato and lettuce. Gluten-free bun, kale, zucchini & quinoa patty, hummus, pickled onion, beetroot, tomato and lettuce. Bacon, egg, cheese, smoked paprika mayo and tomato sauce. Hashbrown, avocado, lettuce, tomato, smoked paprika mayo and tomato sauce. Bacon, egg, hashbrown, avocado, lettuce, tomato, aioli and tomato sauce. Grass-fed beef patty, bacon, chorizo, egg, cheese, aioli and tomato sauce. Choice of a fried chicken piece and chips. Choice of a fried chicken piece and drink. 1 x Huxtaburger, 1 x Regular Chips, 1 x Fried Chicken Piece and 1 x 330ml Soft Drink. Choice of salt, chipotle salt or dill salt. Choice of aioli, sriracha mayo, smoked paprika mayo, cheesy mayo, BBQ, mayo, hummus, tomato sauce and mustard. Fruit Loops Shakes - Limited Edition! Take a trip down memory lane and try this delicious shake before it's gone. Choose from vanilla, chocolate, salted caramel or strawberry.